So today I knuckled under and made my own ravioli…and to be honest it wasn’t as hard or difficult as I thought it might be. The dough is very simple, I mixed it in my Kitchen Aide mixer but I probably could have done it by hand.The dish was a big hit with both of my kids as well as Mr. Rosemary Lane. Use all the dough ingredients and mix until the mixture forms a smooth dough. Once the dough is mixed, cover it with a dry clean towel and let stand for 40 minutes. While the dough is standing, go ahead and mix half of the scallions with the crab meat, ginger powder and the chili sauce and place in the refrigerator for 30 minutes. Split the dough in half and roll out the first half on wax paper or floured surface. It should be long enough to cover your ravioli mold. 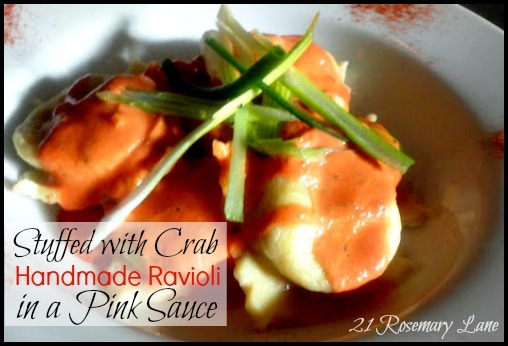 Place small mounds of the crab mixture in the center of each ravioli mold. If you do not have a mold you can roll the dough out on a flat surface and then place the mounds of crab meat approximately 1 - 2 inches apart, depending on how large you would like your ravioli to be. Then in between the crab mounds on the dough gently brush a small amount of water or milk onto the dough. Roll out the second half of dough and lay it over the crab mounds on the first half. If using a mold, with a rolling pin, roll over the top until the metal separators begin to show through. If not using a mold, press the top layer of dough down onto the bottom dough in between the mounds. Let stand for 30 minutes. Cut ravioli or remove from mold and drop into boiling water. Bring pot back to a boil and cook for 5 minutes. Remove ravioli with a slotted spoon and let drain on paper towels. Plate and pour pink sauce over the top garnish with sliced scallion and serve immediately! Makes 12-18 ravioli depending on the size of your raviolis. You are the queen of the food! I make a Semi-Homemade version on this dish...but yours sounds and looks delicious!